Peacefully at the Pembroke Regional Hospital on Tuesday, March 20, 2018,in her 71st year. Sharon Dupuis (nee Weisenberg) of Pembroke,daughter of Celina Lafreniere and Reinhart Weisenberg, beloved wife of the late Robert Edward Dupuis (2007). Loved and cherished mother of Tara Neville (Scott) Pembroke, Jeff Dupuis (Katie) and Jessica Dupuis,of Ottawa. Loving grandmother of Jacob (Marina), Jayden (Ryan),and Eden. Loving great grandmother of Madden. Sister of the late Myrna Rowe (Frank) and Brenda Wyse (Pat). Memorial Liturgy in the Chapel of the MURPHY FUNERAL HOME, 296 Isabella Street, Pembroke, Ontario, on Saturday, May 19, 2018 at 1:00 p.m.. Interment at St. Columba’s Cemetery. In memory of Sharon, donations to the The Pulmonary Hypertension Association of Canada would be appreciated. Condolences, tributes, and donations atwww.murphyfuneralhome.ca. 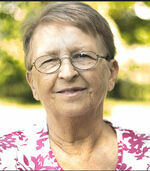 To send flowers to the family of Sharon Ann Dupuis (Weisenberg), please visit our Heartfelt Sympathies Store.